Depending on where you are, the strawberry season can be fleeting. When these luscious red berries are in, you want to get the maximum amount of enjoyment from them while they're at their peak of ripeness. Proper storage is key to maintaining their flavor and aroma, and if you want to enjoy them even longer, there are methods of preservation to capture their essence. Unlike some fruits, strawberries do not ripen after harvest, as they are not responsive to ethylene. Select strawberries that are ripe but not overripe. They should be vibrant red throughout and very fragrant. Discard any berries with mold, blemishes, or soft spots. Strawberries are delicate and exceedingly prone to spoilage. Because they are high in water content, mold, such as Botrytis cinerea (Grey Mold Rot), can set in quickly. For this same reason, you should not wash strawberries until you are ready to eat them or use them in preserves. When ready to eat or preserve, wash the strawberries, pat dry, and trim away the hulls. Cold temperatures and high incidence of carbon dioxide (CO2) help prevent the onset of mold, and high humidity keeps them from shriveling. Store your strawberries whole in a sealed container in the part of the refrigerator that gets as close to freezing (32°F/0°C) as possible. Strawberries will give off CO2 and moisture, creating a good storage environment. The berries should keep up to 10 days. Freezing is an effective method for preserving strawberries. However, keep in mind that ice crystals will form in the flesh of the strawberries, and when they thaw, the berries will become soft and give off liquid. Thawed frozen strawberries are excellent for smoothies, ice cream, baked desserts, and even preserves. Small berries can be left whole; halve or quarter larger berries. Lay the berries out in a single layer on a sheet pan. This allows the berries to freeze more quickly and keeps them separate when stored. Freeze the berries, uncovered, for two hours. Transfer the frozen berries to freezer bags or freezer-safe containers. Label and date the containers. Use within 6 months. 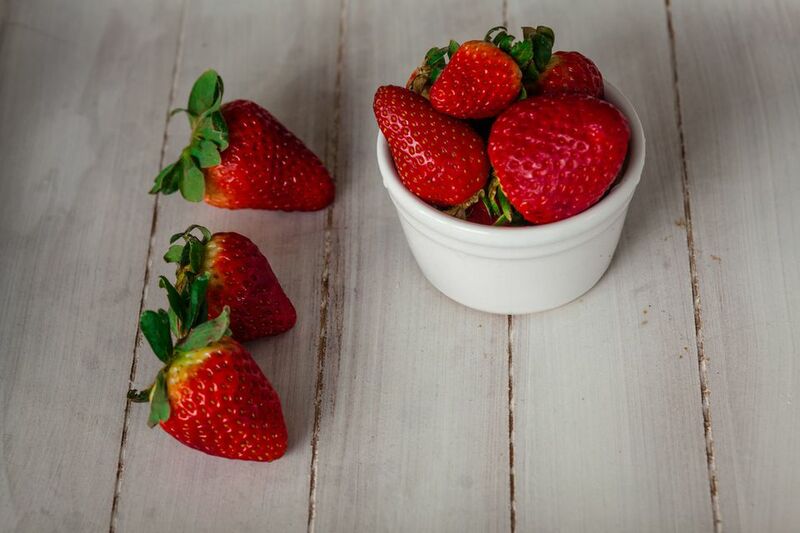 Strawberries are a naturally high-acid fruit, which makes their preserves a good candidate for water bath canning. However, always use a tested recipe from a reliable source. Dried strawberries are a delicious addition to cereal, yogurt, baked goods and more. A dehydrator is the most recommended tool for the job, though they may also be dried in the oven. Slice your clean, trimmed berries into slices ⅛" to ¼" thick, either crosswise or pole-to-pole. Lay the slices out on dehydrator trays, being careful they do not touch. Set the dehydrator to 135°F/57°C, and dry the slices to the desired degree of dehydration. It should take about 8-10 hours until they are pliable, and 10-12 hours to make them crisp. The slices should be dry to the touch. Let them cool, then condition them by putting them into quart jars about ⅔ full and sealing. Give the jars a shake a couple of times a day for a week. This redistributes any lingering moisture in the fruit. If you see condensation on the inside of the jars, the fruit is not dry enough and should go back in the dehydrator. After, store the fruit in airtight containers in a cool, dark place for up to a year, or in a sealed container in the freezer for up to two years. Strawberry fruit leather is another alternative. Simply purée the trimmed berries with sugar and lemon juice, spread into a thin, even layer on parchment on a sheet pan, and dry in a dehydrator or oven until dry but pliable, usually about 10-12 hours. Alcohol is a solvent, so it makes an excellent medium to capture strawberries' rich perfume as an infusion. Vodka is the most neutral base, delivering the most intense strawberry experience, but it also works well in tequila or bourbon. For a non-alcoholic alternative, combine strawberries, vinegar, and sugar to make a shrub. Add herbs or balsamic for a twist. Bonus prize: Save the hulls from your trimmed berries, and steep them in alcohol for a more subtle infusion, or simply in a jug full of water for a delicately flavored refresher. Packing strawberries in a vinegar brine brightens their flavor and firms the flesh. This is best as a quick pickle, for more immediate use. If you can find unripe green strawberries, they pickle especially well. Pickled strawberries are a fabulous addition to salads, or served as part of a cheese plate.